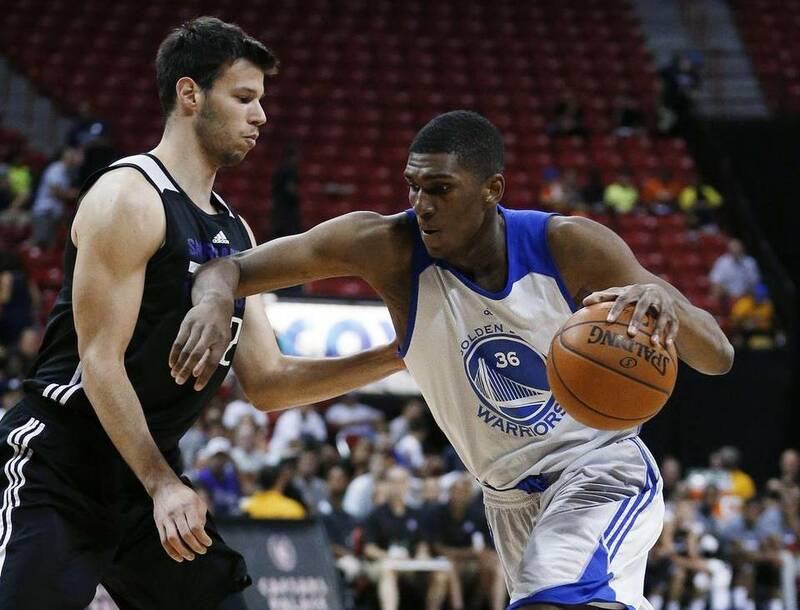 It’s not often talents like Kevon Looney fall into the laps of the defending champions. The Golden State Warriors are still celebrating their first championship since 1975, which saw them finish with the third-best record in league history (83-20). Everything went right for a franchise where wrong was customary. It was a dream season for the former bottom dwellers, but the Warriors don’t want this run to end any time soon. After re-signing Draymond Green, Marreese Speights and LeAndro Barbosa – along with the expected departure of David Lee – the team drafted Kevon Looney out of UCLA with the final selection of the first round. Once thought of as a lottery talent, Looney slipped amidst injury concerns. Listed at 6-foot-9, 220 pounds with a 7′ 3.5” wingspan, Looney is a combo forward with the ability to defend multiple positions, rebound — led all freshmen in the nation with 15 double-doubles and was second amongst freshmen in rebounding – and brings a high motor to team needing just that off the bench. The Warriors won’t ask too much of Looney early on, but that can be attributed to their already sound depth more so than Looney’s development. At 19, Looney has a lot to learn and plenty of time to do so. However, if the last few games of Summer League are any indication, the Warriors just added another intriguing talent to an already championship caliber team. If he can stay healthy, the Warriors found themselves a steal with the #30 pick. I talked with the newest Warrior while in Las Vegas for Summer League, and while he was initially disappointed with his late selection, the Milwaukee native sees the Warriors as a perfect fit. Looney has all the tools to succeed, and the Warriors hope it’s only a matter of time before the rookie makes his presence known on the grandest of stages. Take me through the draft process. What were you hearing from teams and how grueling is that process? You were hailed as a guy with lottery talent. Why do you think you fell? How disappointed were you that you ended up at the end of the first round? I was really disappointed. I didn’t know why I fell. I felt that I did pretty well in my workouts. Nobody really when I played outplayed me. So, that is why I was disappointed. But the best thing happened, I went to the best team in the league and I have a chance to go in learn and develop my game. How much of it do you think was the injury concerns? I think it was mainly injury concerns. They were scared of my injury, I guess. I think that was mainly it because I believe I performed during the workouts. I had a good enough season at UCLA. It was mainly that. Fast forward to draft night. You left the draft room and then came back when you heard your name called. Yes, I left. I was sitting there a long time, like three hours. I went to the bathroom and then everybody came with me. I ended up seeing the commissioner back there and my agent was still saying we had a chance with the Warriors. They called us back, so we went back there and they called my name. I got to shake the commissioner’s hand and it was a great experience. When you are in the draft room, are you checking your phone? Are you checking Twitter? How are you keeping up with everything going on? I was really just sitting there. I was sitting there watching and hoping for someone to call my name. I didn’t look at my phone. My phone was probably dead most of the time, so I wasn’t even looking at it. I was just with my family. My dad, brother, sister, and mom. My agent was sitting next to me trying to tell me what was going on. I wasn’t really looking at my phone. I was just hoping my name got called, so I was really lost out there. What were some of the things that really stood out to you when watching the Warriors last season? Just how much fun they have playing together and how much freedom they get on offense. How they play together and everybody can have the chance to score and make plays for each other. How good they are on defense. You think of a team that scores that way you don’t think of them as a great defensive team but they were really one of the best defensive teams last year, they were the best defensive team last year. I think I can come in and learn from guys like Draymond Green, Shaun Livingston, and Andre Iguodala to help my game. A lot of guys are drafted into rebuilding situations. How fortunate do feel that you were brought in not having to contribute right away with a championship team, coaches, and players? I feel really fortunate. I get to learn the winning ways. I have no pressure, really. I just come in and learn and get better and have a chance to be in the playoffs and compete for a championship and I have a chance to get a ring. That is what every basketball player dreams about. Who called you initially? Did you know that General Manager Bob Myers was a fellow Bruin? Bob Myers actually called me after I got drafted. I didn’t have the chance to come workout for the Warriors, so I really didn’t get to talk to those guys. When I got there, they let me know he was a Bruin. What would you consider to be the strengths of your game? On the flip side, what parts of your game do you feel need work? One of my strengths in my game is my rebounding and versatility. I’ve been getting pretty good as a shooter and my midrange is pretty consistent. I’m trying to extend my range all the way to the three-point line and be more consistent there. Those are probably my biggest strengths. My weaknesses are to get stronger, mature my body, and continue to learn the offense and the terminology and spacing of the Warriors. What makes you a great rebounder? I really don’t know. It’s something that I have always been good at. I just have a knack for it. I guess time and the length and it’s something that you need to have determination and will to be a great rebounder. I call it a tough guy thing. I’m not the most athletic or the strongest guy, but I always have been pretty good at it. You mentioned your strength and weight. How much do you feel you need to add going into next season or even following seasons? I don’t know how much I want to add yet. I’m going to sit down with the strength coach and talk to him and see what their plan is for me. I feel comfortable gaining weight, so I’m going to try and gain weight, I just don’t know how much yet. The league — especially the Warriors — are pushing the pace and spreading the floor. How comfortable are you with your jump shot? What about shooting from deep? We’ve seen some of that in Summer League. I’m real comfortable with it. It’s something I did at UCLA. There was a lot of pick-and-pop and stretching the floor out. I hope to continue that and I know the line goes farther, so I’ll have to extend my range. I’ve been real streaky from the three-point line from NBA range. I’m just trying to be more consistent. I’m real comfortable with shooting the ball, it’s something I feel good doing and that’s one of my strengths. In your game against the New York Knicks, you had a nice between-the-leg step-back move at the elbow that led to a made jumper. Can Warriors fans expect more of that as you progress? That move in particular was the one that stuck out the most to a lot of fans. Yes, that used my go to move but a little shorter. It’s something that I always work on. I work on creating space for my jump shot and creating plays for others. I think that’s something you can expect from me. Making plays and making some nice moves. How has Summer League been for you? It’s your professional debut, coached by Luke Walton and putting that Warriors uniform on for the first time. It’s been a fun experience. It’s been a learning experience. A lot of times, guys are out here and adjusting from college, but they’ve adjusted pretty well especially these last few games. I’m having a lot of fun. How has Luke Walton been as coach and how does it feel to play alongside James Michael McAdoo? Luke Walton has been a great help. He’s been teaching a lot of rookie kids about the game, about offense and defense and how the Warriors play. He’s been a great help for that. As far as playing with McAdoo, it’s been a lot of fun. He has been there a little longer than I have, so I get to learn from him, answering about the team and how things work with the Warriors. He’s also just a great player. How much time have you spent in the Bay Area? I haven’t spent a lot. I’ve been there for about a week or so. I haven’t had the chance to get out there. During my time at UCLA, I was in SoCal most of the time. We came up there for a road trip. Actually threw my birthday up there. We had a game vs. Stanford and Cal so I threw my birthday up there last year. It’s a great city from what I’ve seen so far. I know the fans are the best in the league. I look forward to getting out there. You’ve mentioned previously that you’re a huge Kobe Bryant fan. Now that you’re in the same division, wow much are you looking forward to playing him? What have you taken from his game, if anything? It’ll be a dream come true to play against him. He’s one of the best players ever. I’m looking forward to that. I’ve always watched his post moves. He’s really good in the post and his footwork. Everybody talks about his work ethic and that’s also something I aspire to have. Twitter is huge in the Bay Area, to say the least. Are you planning to tweet more? Yeah, I think I’m going to try and tweet a bit more. I haven’t tweeted a lot, really ever, so I’m going to try and be more active and interact with more people. What are you listening to right now? If someone handed you the aux cord, what are the first songs that you’re playing? Future just dropped a new album so I’m playing that right now. Meek Mill just dropped a new album. Those are my two albums I’m playing right now. Are you part of the #FutureHive? I am. I am. I’m definitely part of the #FutureHive. What are you favorite tracks off Dirty Sprite 2? Or is the whole thing fire to you? The whole thing is good right now. I’ve been listening to the song with Drake a lot right now. That’s probably my favorite right now.